Experts predict Friday will trail only the Saturday before Christmas as 2018's top U.S. shopping day. As holiday shoppers are on target to spend up to $721 billion, retailers use new tricks to lure customers for Black Friday. High on the booming economy and rising wages, U.S. consumers are expected to spend big this holiday season. 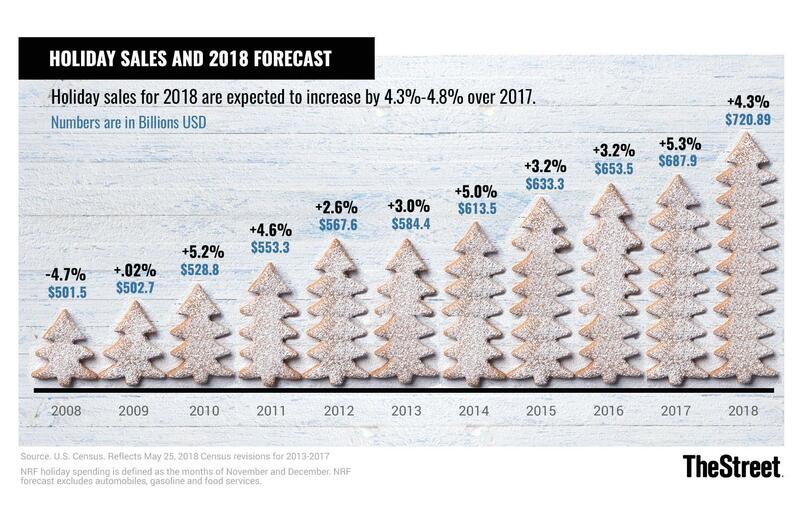 Retailers are forecast to see as much as $721 billion in sales through the end of December -- a dramatic jump from the $501 billion over the same period a decade ago and a potential 4.8% bump over last year, according to the National Retail Federation. A big chunk of shoppers' holiday budgets will pour into Black Friday deals. The post-Thanksgiving bonanza is expected to be the second biggest day for merchants this year, trailing only the Saturday before Christmas. "For consumers, right now their spend limit is at an all-time high," said NRF spokesperson Ana Smith. Many are even willing to take on debt when holiday shopping, she said. Approximately 164 million Americans are expected to shop throughout the five-day Thanksgiving break from Thursday through Monday, reports the retail group, which conducted a survey with Prosper Insights & Analytics. But retailers face a challenge: How do they win shoppers when every other merchant is also baiting them with half-price TVs? "Retailers are having to step up their game," said Sarah Hollenbeck, a shopping and retail expert with BlackFriday.com, a product of publisher Ziff Davis. To lure shoppers, retailers such as Target (TGT - Get Report) , Walmart (WMT - Get Report) , Lowe's (LOW - Get Report) , Amazon (AMZN - Get Report) , eBay (EBAY - Get Report) and others are moving beyond low prices. They're stretching Black Friday into days -- and in some cases, weeks -- of deals. For example, online marketplace eBay -- the only one of those five retailers whose shares haven't fallen in the past five market days -- has turned the post-Turkey Day spree into a week of discounts that climaxes on Friday when consumers can snag big electronics deals, like a Samsung 40-inch TV for half price. Competitor Amazon has a similar seven-day bonanza, with free shipping offers and slashed prices on its gadgets including Echo speakers and Kindle tablets. Lowe's and Target have squeezed even more out of Black Friday, turning the day into a nearly month-long event and offering big deals. Target is displaying over a dozen TVs for under $300 and Lowe's is offering $600 gift cards for shoppers who buy two select big-ticket appliances at around $400 each. Retailers are investing in new technology to guide buyers and help them skip lines at the register. Target promises to use innovation to speed up store checkouts by letting staff scan products and accept credit cards anywhere in the store. Rival Walmart has a similar checkout scheme that allows shoppers to find in-store buys with a special Black Friday map on the Walmart app for smartphones. Merchants are also swallowing shipping costs for the sake of sales. Shoppers are growing more sophisticated -- and pickier. Most this year want quality over the lowest prices, said Hollenbeck at BlackFriday.com, and are looking for perks like free shipping. In fact, sellers are blurring the line between brick-and-mortar and online shopping. The NRF's Smith said the strategy is to target each type of customer -- those who like to shop in person vs. those who like to shop online, and those who want the best deal vs. those who most prize convenience. "This is a consumer that is shopping on all channels necessary," Smith says. Consumers are also willing to spend more on Black Friday compared with other discount days such as Cyber Monday or Small Business Saturday. Shoppers will likely spend on average up to $472 on Black Friday, $57 more than on Cyber Monday, according to BlackFriday.com. Black Friday, which now takes over nearly the entire month of November, has become "like a drug for the retailers," said Robert Hetu, a retail analyst with Gartner. But the special effort works -- shoppers are opening their wallets and putting money into retailers' registers earlier in the holiday season, which is critical to stores' financial health. Hetu said nearly every major merchant will get a boost from the day, but the ones who've been investing in digitization strategies and "melding together their online and store presence" will perform the best. Of course, exceptions exist. For example, JCPenney Co. (JCP - Get Report) has seen its share price tank over the years from a high of nearly $11.60 in 2016 to barely $1.30 in recent days. Sears Holdings and its Sears and Kmart stores are also struggling, closing dozens of shops and flailing in Chapter 11 bankruptcy. As for the main sale drivers this holiday, look for the usual suspects -- TVs, game consoles and so-called "smart-home" gadgets. Hetu said such items will get people into the door on Black Friday, but customers won't stop there -- and merchants know it. "It's obvious that electronics steal the show," he said, "but [retailers] are hoping that's going to lift all boats."